Diversity and inclusion are not seasonal and require more than a limited-time-only engagement. Organizations cannot just celebrate diversity within a finite period and expect sustained understanding, buy-in, or impact. 'Tis the season to be thankful, jolly, joyful, and merry. Celebrations abound. For at least six weeks out of the year, we seem to laugh with a little more cheer, give with a little more enthusiasm, and treat each other with a little more warmth. The feeling is contagious, as if we might start an epidemic of kindness. We ring in the New Year with enough excitement and fanfare to light entire cities and it seems as though our energy of the moment could last for the next 364 days. But it doesn't. As the weeks progress, we find ourselves more often than not getting back to our usual business, typical routines, and old habits – despite new resolutions. Our celebrations, along with the accompanying contagion of excitement, gets put back on the shelf until the next season's Brown Thursday, Black Friday, Cyber Monday, or Giving Tuesday. There is a similar dynamic that happens in diversity and inclusion. Over the years, I have witnessed companies proudly announce “diversity weeks” or “multicultural months.” As frequently, I have counseled those who could not understand why their organizations weren't gaining the desired traction in diversity. They didn't see how they were derailing their own efforts. Diversity and inclusion are not seasonal and require more than a limited-time-only engagement. I can certainly appreciate festive celebrations, but while multicultural pot luck lunches, essay contests, vendor booths, visiting speakers and musical acts make for fun times and opportunities for brief, albeit important cultural exchanges, they are rarely teachable moments that prompt significant culture or behavioral change. Organizations cannot just celebrate diversity within a finite period and expect sustained understanding, buy-in, or impact. Putting a celebratory spotlight on diversity issues may raise awareness for some and perhaps even temporarily enlighten others, but if the goal is to drive long-term organizational change and individual accountability, an ongoing and unwavering commitment combined with aligned action is needed. We must ask ourselves: what's next after the celebration? What messages are being sent about what is required to make meaningful strides in diversity and inclusion if the conversation ends when the party's over? What happens when the momentum gained during these activities screeches to a halt when the last banner is taken down or another corporate “celebration” begins? When diversity celebrations are not reinforced by strategic programs and executive communications throughout the year, real progress is undermined. As PR pros, we know better than anyone that words, though powerful, can only take us so far. William Shakespeare said, “Talking isn't doing. It is a kind of good deed to say well; and yet words are not deeds.” Diversity celebrations fit somewhere in the middle – with a lot usually being said, but with less deeds aimed at carrying the mission forward. Diversity messages must be backed by consistent actions – and reinforced via repetition and multichannel, multiple-platform delivery – to make any effort truly powerful, credible, and, most importantly, sustainable. As we enter this holiday season, perhaps we can think about celebrating diversity a little less and begin living it a little more. Who knows? We might just start an epidemic. 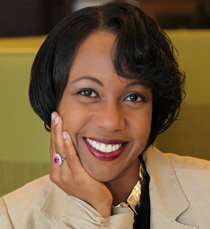 Latraviette Smith, former VP, global diversity and inclusion for American Express, has spent 15 years in communications in agency corporate, consumer, and multicultural PR, as well as senior marketing roles. Her column will focus on the PR industry's ongoing efforts to advance diversity among its ranks at all levels. Connect with her via LinkedIn or at latraviette@gmail.com.